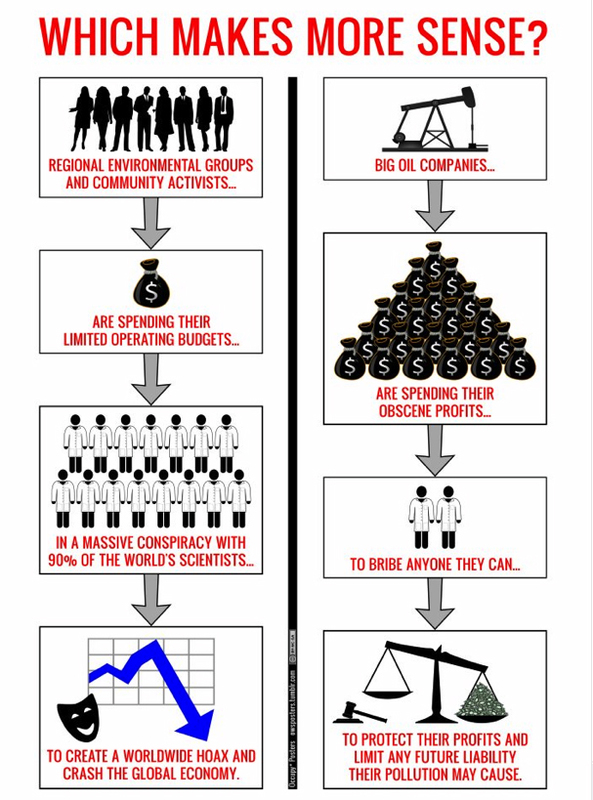 I believe the image below, from Climate Progress, does a great job of illustrating why those conspiracy theories make no sense at all. Conspiracy theory. Image: Climate Progress. I am truly disgusted at the widespread ignorance. I’m also really saddened that people choose to take a reactionary role in our world rather than a proactive one. As with any other challenge, it’s much easier to believe it’s a conspiracy than to admit there’s a problem and actually have to suffer to do something about it! Good for you for being active in your area. That’s actually something I would like to do more of. It’s funny you should wonder “Do they not see the changes in weather patterns”. This weekend, I had a short “back and forth” with a commenter on a Huffington Post environmental blog and I pointed out all of the record weather events that occurred in 2011. His response was something along the lines of “that is anecdotal evidence and NO ONE can know that those events are caused by climate changed.” Yes, he wrote “no one” in all caps. Then he followed that up by stating that transitioning to renewable energy would be disastrous, especially for people in poor countries. In other words, I share your frustration! I find it completely abominable that the loudest voices seem to be the ones denying the significance of climate change. I’ve said it before… it’s UNCOMFORTABLE to think of what might have to be given up to save the earth… how incredibly selfish and lazy humans have become. To selfish and lazy, I would as short-sighted. The earlier we start making changes, the less it will hurt… and vice versa. Easily. I think it’s explained by redefining as ‘wilful ignorance‘. Pointing out that the IPCC has concluded that recent extreme weather can be linked to climate change will, no doubt, be met by accusations of IPCC bias, and off we go round the merry-go-round once again. “Changes in other extremes, such as more intense and longer droughts are observed in some regions, but the assessment assigns medium confidence due to a lack of direct observations and a lack of agreement in the available scientific studies. Confidence in any long-term trend in tropical cyclone intensity, frequency or duration is assessed to be low,” he added. It is the “merry-go-round” that I find most frustrating. How do discuss these issues with someone who has an inherent distrust for the science? A short while ago I came upon an article that touches on the point that If we are involved in science of which some aspects are not commensurate with the cultural milieu, then we are told that our science is flawed — a sentiment I find myself in agreement with. I think the only answer is to dismiss people who insist on staying on the merry-go-round as lost in cognitive dissonance and move on, seeking conversations with people open to the facts. That is good advice and something I have begun doing. I find myself wanting to convince them, to “show them the light”. However, when the “merry-go-round” kicks in, I stop replying to their comments. I like the quote as well. I’ll have to keep it in mind. Could you provide a link to ‘G+’, food forays? Ignorant, short-sighted.. there are SO many terms… When I say ignorant, I’m using the true sense of the word, not the insult form. (Although both could certainly apply!) In my mind, ignorance is incompetence due to laziness… To sum it up Canuck-Style.. they really (*$R%& me off!!! I’m still learning my blog works as well! Glad to help when I can! I’ll look into it. Thanks again.